From the Kitchen – Pot Stickers and Bagels: nope they have nothing in common that I can think of…. Since I now have a fair amount of free time, I have been back in the kitchen trying out some recipes that I’ve wanted to try but was too nervous about to waste a weekend day on. A while ago, I made bao (steamed buns) from Andrea Nguyen’s Asian Dumplings. The next recipe I had wanted to try pot stickers since I love them, always get them from our local Chinese take-out Golden Chopsticks, and could drink the dipping sauce straight. The following are my notes and opinions about the recipe. For the real thing, go out and get the book. You can also get some info on Ms. Nguyen’s website: http://www.asiandumplingtips.com/ Warning, there is a video that launches automatically and it has sound. I very much dislike websites that do that. To kill the video, you’ll have to go the lower quarter of the page. The dumpling dough is about as basic as a dough can get. It’s 10 ounces of flour (around .28 kg) of all purpose flour and ¾ of a cup (177 mL) of boiling water. Since I have a food processor, I used that method, flour in and then hot water poured into the processor in a steady stream until the dough forms. If your processor has a dough button, I recommend using that. The dough will be fairly stiff. Take it out of the processor (It will be warm), knead a minute or two and then stick it in a sealed plastic bag. This will allow it to fully hydrate and soften. It will steam up the bag, leave it sit at least 20 minutes. Now, one has to get the dough into little thin discs so they can be wrapped around the filling. I, not having a tortilla press as Ms. Nguyen recommends or wanting to have yet one more kitchen toy to figure out where to store, looked around for something else to use. My eyes lit upon my pasta rolling attachment for my Kitchenaid mixer. I cut the dough in half and ran each half through on the number 1 setting of the roller to get the approximately 1/8” thick (3.2 mm) recommended. I cut out the dough using one of my saved bamboo shoot tins (3 ¼ inch diameter, 8.25 cm -to be used to make crumpets in the future), and then rolled the edges thinner using a small cylindrical glass. I also tried a few run through the roller at the #2 setting and it didn’t seem to make much difference. 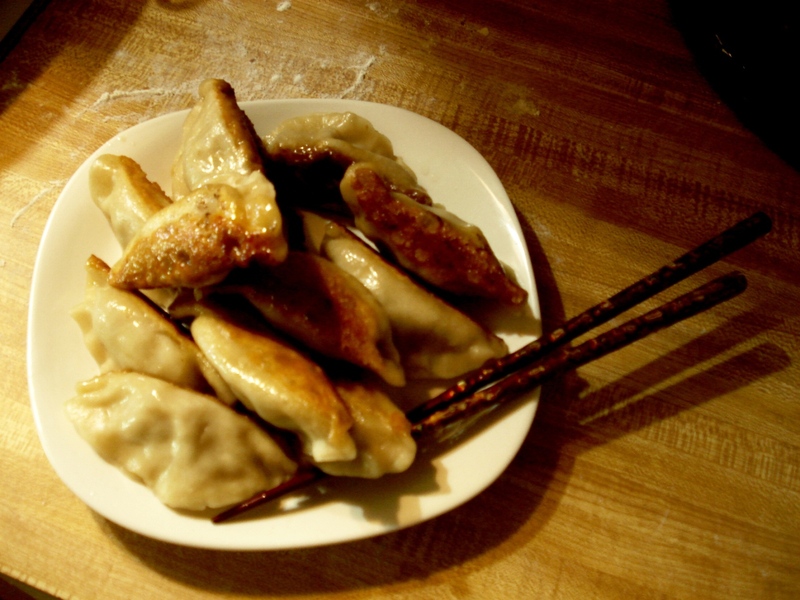 I used Ms. Nguyen’s Japanese Pork and Shrimp Pot Stickers (Gyoza) recipe as a guide. I had no shrimp, and forgot the cabbage so we just had pork pot stickers. Again, if you want the actually recipe, get the book. The basic mix is ground pork (left over from making homemade sausage), grated fresh ginger, garlic, soy, sake and a little sesame oil. It also called for Chinese chives or green scallions. I had none but I did have some wild onions happily growing in my yard. We don’t use pesticides so they got harvested and in they went. I made the basic half-moon shape; putting about a tablespoon of filling into the center of the wrapper, and folding it in half, pressing the bottom of the dumpling flat so it will stand upright. Just pressing the dough together seems to work well enough for potstickers, but I would recommend brushing a little water or egg wash around the edges if one was going to boil these. I think they’d pop open during the boiling action. A tablespoon of oil was heated in a medium sized non-stick skillet. When it was hot, I placed the dumplings in flat side down and fried them for a couple of minutes until the bottoms got golden brown. The next part is mildly dangerous. When the dumplings get the color you want, you will then pour in 1/3 cup of water on the hot oil. Have a large lid ready to block some of the spray and to lock in the steam. My cookbook has a lovely pattern of oil spots on the gyoza recipe pages now 🙂 Reduce the heat to medium and let cook 6-8 minutes to steam the dumplings. At the end of that time, tilt the lid to allow the steam to escape and to start the frying process again. When you hear a nice low sizzle, pull the lid off entirely and fry for another couple of minutes. Lift a dumpling to check on its golden bottom (tongs are especially good for this) and cook to your preference. And then we go thousands of miles to the west of China for the next experiment: Bagels! I’ve always avoided making bagels since 1. I can get decent ones thanks to living in an area with three synagogues within easy walking distance, and 2. boiling dough always makes me skittish, imagining the result to be a large pot of hot wallpaper paste. 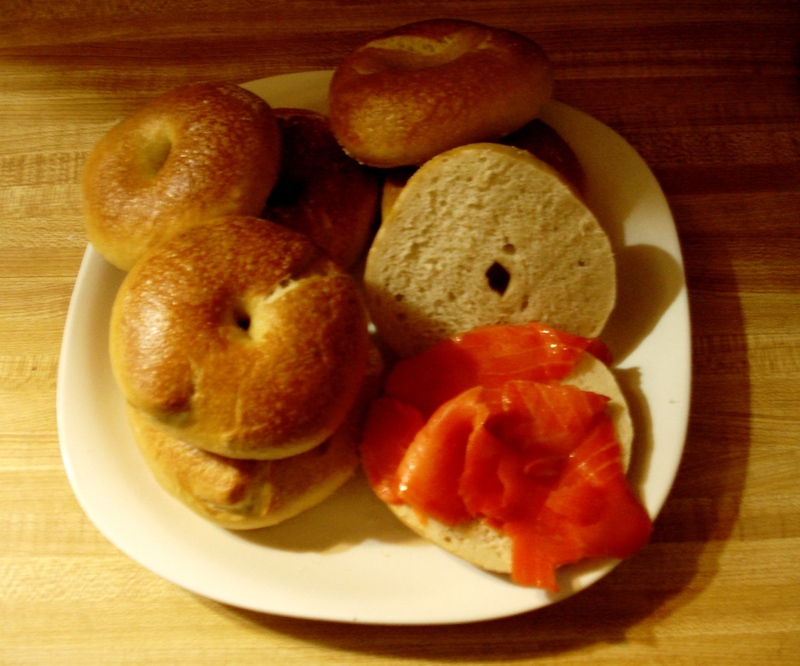 That’s a bit of lox on the one bagel. The recipe I used is here. My only change is that I boiled the bagels for one minute on each side since I didn’t want to fight with too tough a crust. If you only have bread flour, I suggest you make it into high-gluten flour (can be found here at King Arthur )by adding a teaspoon of vital wheat gluten (one brand here; often can be found in the organic section of the grocery) to each cup of flour. I think it does make a difference. Obviously, these are not for those with gluten intolerance. The recipe halves nicely, and I only made 8 this time around. Never made either recipe before, but they came out pretty well. That feels pretty good since I’m still a little scared about leaving my job to seek saner pastures. Readers, I wish you the same good luck in your attempts to try something new. Even a failure can help, if you learn something important. What potstickers and bagels have in common is that I love both of them! I’ve made potstickers from scratch a couple of times, and they were good, but a lot of time and trouble. But my local Korean grocery has about 50 kinds in their freezer case, so I usually have a bag or two in my freezer at home for whenever I get a craving. Or, as a partial shortcut, you can buy frozen premade dough circles, so you don’t have to deal with the dough, just the filling. My sauce uses Sriracha instead of pepper flakes, because it mixes better, and I’ll sometimes add some hoisin sauce or honey in place of sugar. heh, if I could mainline sriracha and hoisin, I’d be happy 🙂 I definitely need to go visit my local Asian market.